A step by step guide to getting started with Rise Vision's free digital signage platform. Getting your digital signage project started with Rise Vision is easy! Follow the simple steps outlined below and you’ll have good-looking content on your displays in no time. What can you use digital signage for? Digital signage has hundreds if not thousands of different use cases. It’s used by everyone from Fortune 100 to elementary schools and manufacturing facilities. We’ve written a few case studies that can give you some ideas of what you can use digital signage for. Digital signage is not an inexpensive endeavor, but, with new technology, free resources and the right implementation the benefits can far outweigh the costs. The cost of media players has fallen dramatically in the past few years. There are great entry level and low cost media players for under $500 some for even less than $100! An important thing to remember is that we support Windows and Linux, you can use other operating systems but we do not support them. There are tons of options for displays, this section could warrant an entire book. But a high level overview is as follows. If you aren’t going to be running your signage for the majority of the day, or it’s not critical that it is always online, then a television from Best Buy could work. If your digital signage is going to be playing the majority of every day and it’s important to you it stays online, then we recommend a commercial display. We offer a few options in our store. Lastly, if you need a screen larger than 98”, you will need to look into options like tight pixel pitch LED. If you’re interested in LED displays send us a note here. We’ve all heard content is king, and yes, it’s overused but it bears repeating. What you put on your display is a huge part of what makes your digital signage successful. Well designed and thought out content is far more effective than something pieced together sporadically. Good design is easy to understand, effective and it should portray credibility.There are a few things to consider when planning content. For content to be delivered to your display it needs to be hosted somewhere. We have an application called Rise Storage that makes this very easy but some organizations prefer third party tools like Amazon s3 or Rackspace. It’s completely up to you and you can learn more here. Do you have designers or developers in your organization? If you have design and development resources in your organization you may be able to get them to help you design and build your digital signage content. Will you require data? News, sports, weather, financial, social media, etc… Many of these will cost extra. If you are planning on using these in your content you should review the prices in our store here. Will you be designing your digital signage content? If you’ll be doing all of the designing and building then you won’t have to budget for design help. There are lots of services you can leverage to make getting started with and managing a digital signage installation easier. Some of our most popular services are content management, priority support and installation. To keep your audience engaged and coming back, you need current and fresh content. The frequency of these updates will vary depending on how you’re using digital signage and your organization's goals. We’ll work with you to determine how often your Presentations will need to be updated and we’ll set you up with the plan that best fits your needs. Not sure how to properly (and safely) install your Displays? Configure your media players? Deal with all of the mounts and wiring options? We provide complete turnkey installations. If you’ll need installation services for your digital signage send us a note here. There are a few ways you can buy from Rise Vision. The primary way is through our store here. But if you need to purchase on account, need an invoice or to send us a PO, email sales@risevision.com with your request and we’ll help you out as soon as possible. 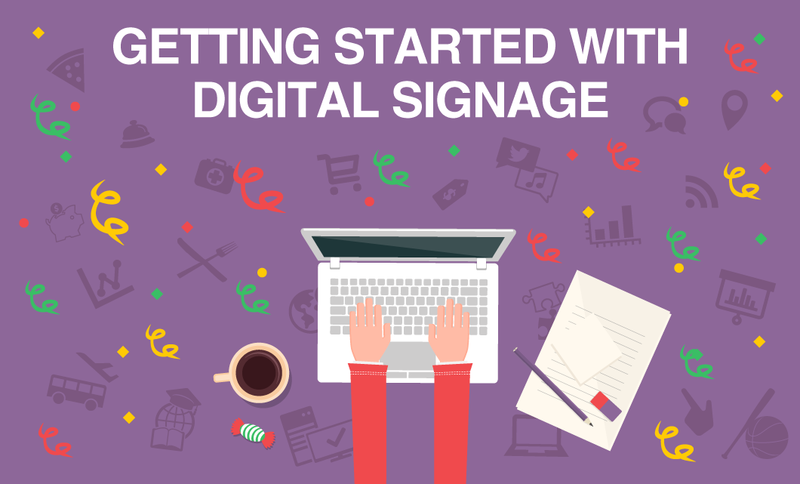 What do you need to get started with digital signage? Alright, so you’ve figured out all of the potential costs of a digital signage project but what do you need to just get started? Rise Vision is free, all accounts come with unlimited users, displays and presentations. There are no ads and you don’t need to enter a credit card. Sign up, try out some free trials, and see how you like everything. If you have any questions jump in our Community and create a post. Once you’re signed up the next step is to start creating a Presentation. You can read this article to help you get started with creating a Presentation or watch the video below. PS: The Image and Video templates are great for getting started! Once you’ve created your first Presentation, head to the Displays page of Rise Vision and add a Display. You can follow the steps here if you get stuck or just watch the video below. Now that you’ve created a Display and a Presentation it’s time to create a Schedule. Navigate to the Schedules page of Rise Vision and create a Schedule. Then add your Presentation as a playlist item (you can leave all the default settings, select all Displays and click save. Need more help? Here's an in depth loook at Schedules. This is where the magic happens. Plug your media player into your TV or display and connect it to the internet. Now open up the web browser of your choice and navigate to https://help.risevision.com/hc/en-us/articles/115000860926-Displays. Once you’re there download the installer for your operating system. Once it’s downloaded start it up, you’ll soon be prompted for a Display ID, enter the numbers and letters you wrote down during Step 3. Within a minute or two you should have your Presentation playing on your display! Woohoo!Now that you’ve finished the hard part and learned the basics check out some of the articles and links below to learn more. With digital signage, the possibilities are endless!